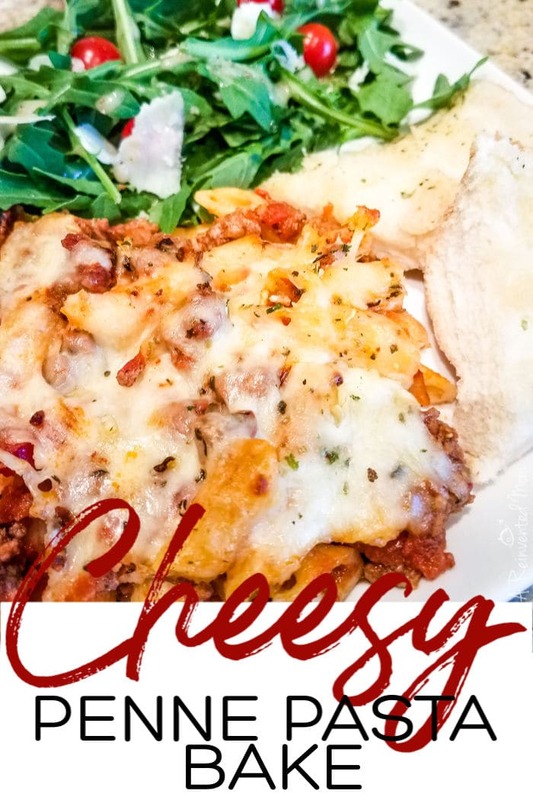 Easy Cheesy Penne Pasta Bake combines tender pasta & ground beef with a garlicy red sauce and cheese. Lots of cheese. Forty-five minutes from start to finish make this a weeknight meal option. There’s a reason Cheesy Penne Pasta Bake is my go-to pasta dish – it always comes through in a pinch. 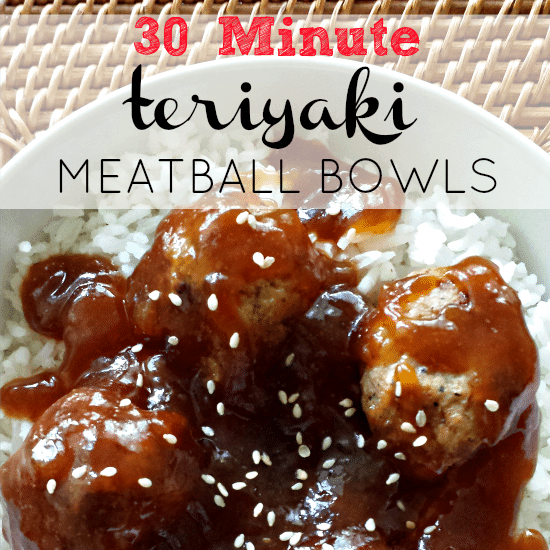 Short on time but need something easy to fill hungry bellies? Check! Looking for a recipe you can make ahead and bake later? Check! Need an easy potluck dish? Check! Need an inexpensive meal for hosting a team dinner? Check! And I haven’t even gotten to why your family will love this dish! 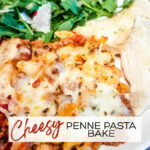 Cheesy Penne Pasta Bake is a long time family favorite meal my entire family enjoys. My kids love it because it has….pasta. They will eat almost anything if it involves pasta. The garlicy red sauce ropes me in. I would be happy dipping a slice of bread into a bowl of sauce – sooo good. And the cheese? Gah! Who doesn’t like warm ooey, gooey melted cheese? Serve this delicious pan of pasta with a simple green salad and garlic bread for an easy weeknight meal. Use ground turkey for a healthier version. This dish is only as good as the spaghetti sauce you are using. With limited ingredients, you’ll want to use a higher quality sauce for best results. I use Victoria’s White Linen sauce from Costco or Bertolli from the grocery store. If you don’t have garlic-flavored pasta sauce, add a couple cloves of minced garlic to regular sauce. This recipe can be easily doubled or tripled for larger groups. I always come home with an empty pan when I’ve served this at team dinners and potlucks. Use pre-cooked bulk ground beef to make this a 30-minute meal. Can I Make Penne Pasta Bake in Advance? Yes! Follow the steps up to the baking point. Cover the dish and store in the refrigerator until you’re ready to make it (I use these casserole dishes with lids when I make this recipe ahead of time). When you’re ready to make the dish, remove from the frig and allow it to hang out on the counter while the oven preheats. Bake as directed. You may need to increase the baking time a bit to achieve gooey, slightly browned cheese. Ground meat chopper – I use this EVERY time I cook ground meat. And it’s under $10! Oil spray – I’ve been using this spray and prefer it over traditional non-stick spray. Large saute pan – you need a BIG pan to mix all the ingredients together. 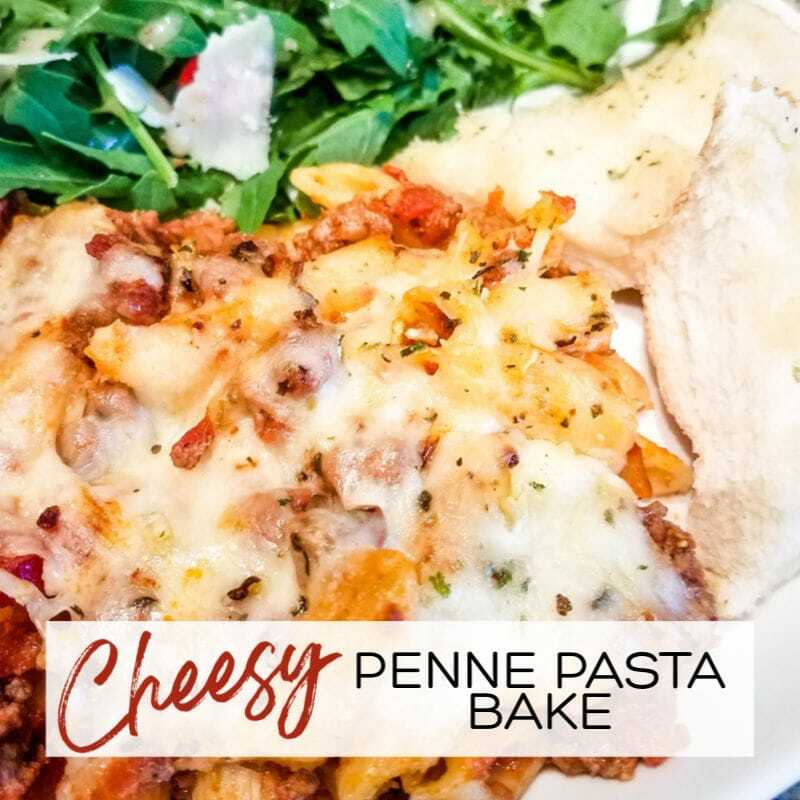 If you’re looking for a new go-to pasta recipe, give Easy Cheesy Penne Pasta Bake a try. 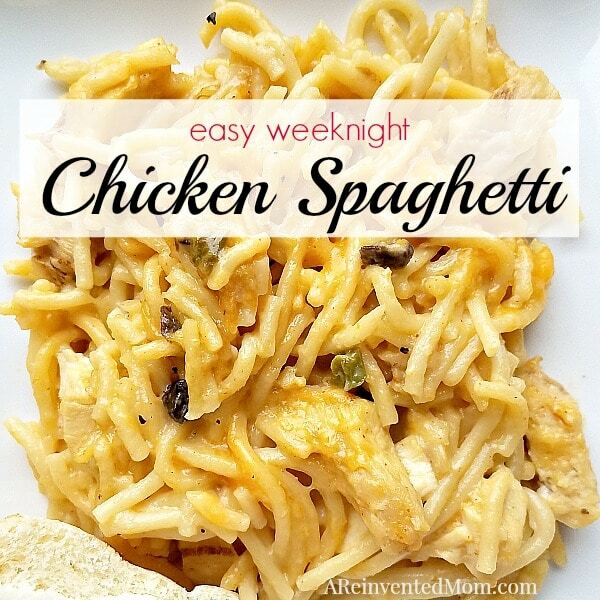 Or share with a busy Mama who needs a quick dinner to feed her family. Originally published on 5/27/15 and updated on 2/14/19. Follow A Reinvented Mom on Facebook, Pinterest, Instagram and Twitter. I’ve shared this recipe at Weekend Potluck and Meal Plan Monday. 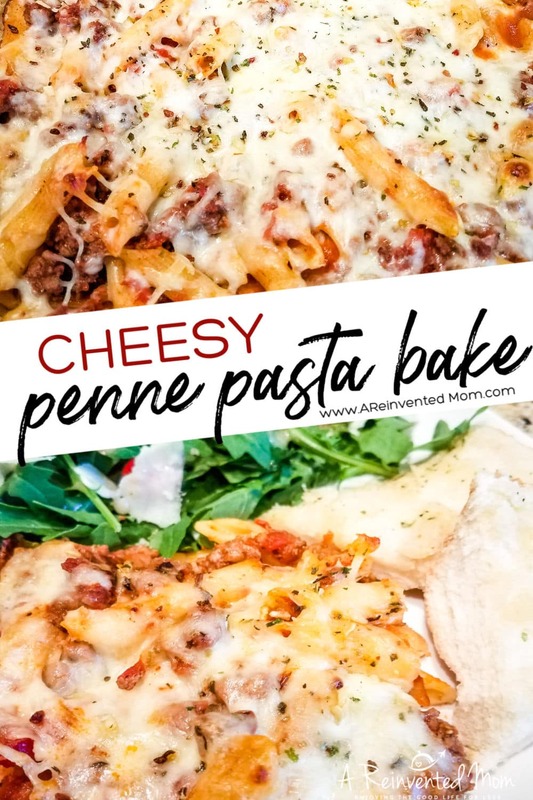 Easy Cheesy Penne Pasta Bake combines tender pasta & ground beef with a garlicy red sauce and cheese. Lots of cheese. 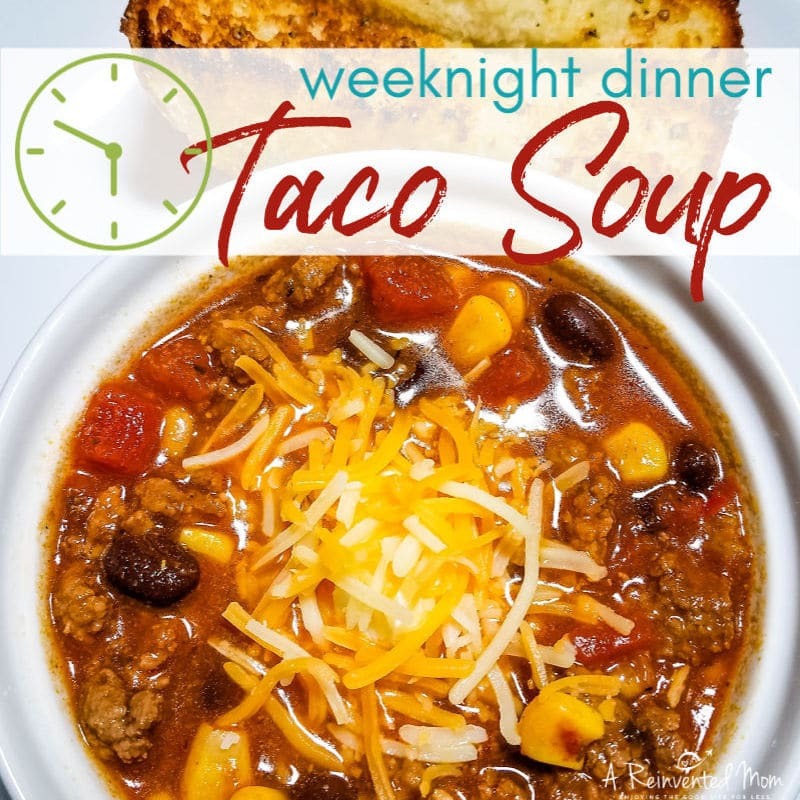 Forty-five minutes from start to finish make this an ideal weeknight meal. Preheat oven to 400 degrees. Spray a 9x13 casserole dish with non-stick spray. Add ground beef, chopped onion, salt and pepper to a large skillet, and cook until browned. I use a meat chopper when I cook ground beef. Drain grease. Add spaghetti sauce to drained ground beef and stir to combine. Simmer on low heat for 10 minutes. Add cooked & drained Penne pasta to ground beef & sauce mixture; stir gently to combine. Place mixture in greased casserole dish and top with shredded mozzarella cheese. Bake for 20-30 minutes, until cheese is melted and lightly browned. You can substitute ground turkey for the ground beef. If you don't have garlic flavored spaghetti sauce, add a couple cloves of minced garlic to regular sauce. 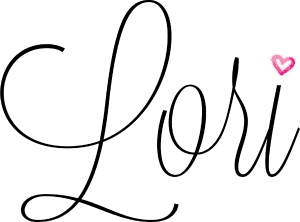 Recipe can be doubled or tripled for larger groups. Turn this into an easy 30-minute meal by using pre-cooked bulk ground beef. Nutritional information provided as a reference only.